JH: Hi Mark, I hear you have a new album out. What can you tell me about it and do you mind some further questions? MTS: OK the album is called 'A Far Cry From New Jersey' and it's my 'thank you' to all of the amazing people who looked after me and supported the band in New Jersey in the 2 years before I joined Praying Mantis for the 'Cry For The New World' tour. It features Dave Rosenthal ex Rainbow & Red Dawn.. he's just finished working with Yngwe.. and Departure's multi-talented Mike Walsh. It's my release through Mainframe Records and it honours a promise to the US guys...it was one hell of a special time! Totally different to the Praying Mantis songs by the way...obviously American influenced. I'm not sure what you want to know with regard to my time with Praying Mantis, what I can tell you is I'm very glad I went and the shows were great especially Osaka and the last show in Club Citta. Pony Canyon were brilliant and really looked after us. The Japanese fans were lovely, I have made good friends of three of them who have been here to visit on a couple of occasions and a number of others still send postcards and letters. It was great to work with Gary Flounders again as we'd got on so well in Flight 19 but really as you are probably aware Praying Mantis and myself just did not 'gel'. They're a very close bunch of guys and I didn't fit in so it became really awkward for all of us. Shame really because I thought that Tino and myself could have written some good songs together...I still love 'A Moment In Life'...and being around Bruce was hilarious!!! I wish them all well. That's about it really. If you'd like to know anything else feel free to ask. JH: The other day I got to see the clip of you doing Mutuma's World (A Japanese TV Program) in Japan. The Acoustic "Moment In Life" was very interesting to see. Of course they did it just before you joined as a three piece too. Ah while I think about it why did Bruce only appear at the end of that appearance? Was it because it was not easy to fit him in or what? MTS: As it was an acoustic version there wasn't anything for him to do.. anyway he would have only cracked us all up, he only had to look at you and he'd set you off. An incredibly funny bloke!! MTS: No I didn't audition. They had heard the Flight 19 tapes. Neal was in London the last time I talked to him but that was 4 years ago...in fact I haven't spoken to Gary since then either. He moved and never phoned to let me know his new address.. if you ever hear of anyone bumping in to him, please let me know. JH: Is the following you correct history? Is there anything else you have done? M.G.MacMillan tells me "Mark Thompson-Smith was in Idol Rich, who released the private 'Working girls' 12" in 1985. Mark didn't sing on this though. After being replaced by Snake from Tobruk he formed a band called Touche, who I don't think got round to releasing anything." I was in Idol Rich and there was a cassette release with an entirely different version of Boys are Missing Out which I later rewrote in my next band Touche. Nick Burr isn't Clive's brother by the way. Touche became Lionsheart. I was the vocalist originally but the music was slightly different, more commercial. I was approached by Sanctuary to join Jagged Edge but we were negotiating with Atlantic at the time. 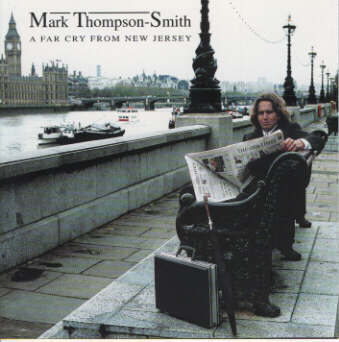 "In this page you say: "Mark Thompson-Smith and Gary Flounders, who is a producer of "A Cry for The New World" and support keyboard player of 1993 tour, recorded 2 songs for "Metal For Muthas '92' (Pony Canyon PCCY-00392) as FLIGHT 19 ". Actually I have this album, and in the notes says: "As a point of interest, their current session guitar player, Mark Smith, is in fact a fully qualified pilot and first officer, having graduated from British Airways flight school with honours as 22, the youngest qualified 747 pilot in the fleet, following in his dad's footsteps!!" As you can realise this guy was 22 in '92 so he is 27 now. Is there a chance he is the same person?" I have just doubled checked my copy of the album and there is no mention of you at all. MTS: Yes I must admit the coincidence has caused me to laugh when my friend, Yayoi told me that I was a pilot!!! I never actually met Mark when I recorded my vocals. Flight 19 was a writing project but I do remember there being five musicians in the same room at least once!!! JH: So are you actually one the Mouths 92 CD or was it just as you said a writing project with no output? MTS: Yes, that's me on the CD..I should have said recording project too. MTS: Let's just say that they have a very relaxed approach to rehearsing, recording and playing live where as I don't but they certainly know how to have a good time!! MTS: I can't remember exactly but it was very fast as far as I was concerned. Maybe four days or so. JH: I assume that your Vocal on One Moment in Life. Is literally your voice replacing Colleen's voice in the Original Mix? With a few seconds at the front cut off. MTS: No it was a complete re-recording as far as I remember, I could be wrong though. JH: Interesting I will have to play them side by side again I was convinced they were duplicated except for you and Colin. I also assumed that was why Colin was credited as Backing vocals still. JH: What was your involvement with Whose Life is it Anyway? That track seemed to me to have Leaning to a more Heavy Metal sound is that the direction you wanted to go or am I interpreting your influence on the song wrong? MTS: I'd literally never heard the song until I stepped in to the studio. Chris was still writing the words but I felt that the melody and rhythm didn't fit so I changed it as it need a Whitesnake feel and tidied up the lyrics. The chorus was already written. I have sung heavy metal type songs before but no I prefer powerful melodic rock. I just listened to the backing track and sang accordingly. JH: What has been the highlight of your Musical Career so far. What would you like to achieve? MTS: Playing the Ritz in New York with my American band and also playing as special guests with Xenon at Club Bene in Sayreville, New Jersey on Thanksgiving Eve 1995 three years after I'd left the States....and of course seeing the reaction of the Praying Mantis fans at the gigs in Japan.....wonderfully loyal people. MTS: Difficult really as I like good music of all types, not just rock. I love soul, funk, classical .... music in general really. My favourite singers are Ann Wilson, Steve Perry, Eric Martin and two others, John Farnham and .....Tom Jones!! I saw him just over a year ago and he was awesome!